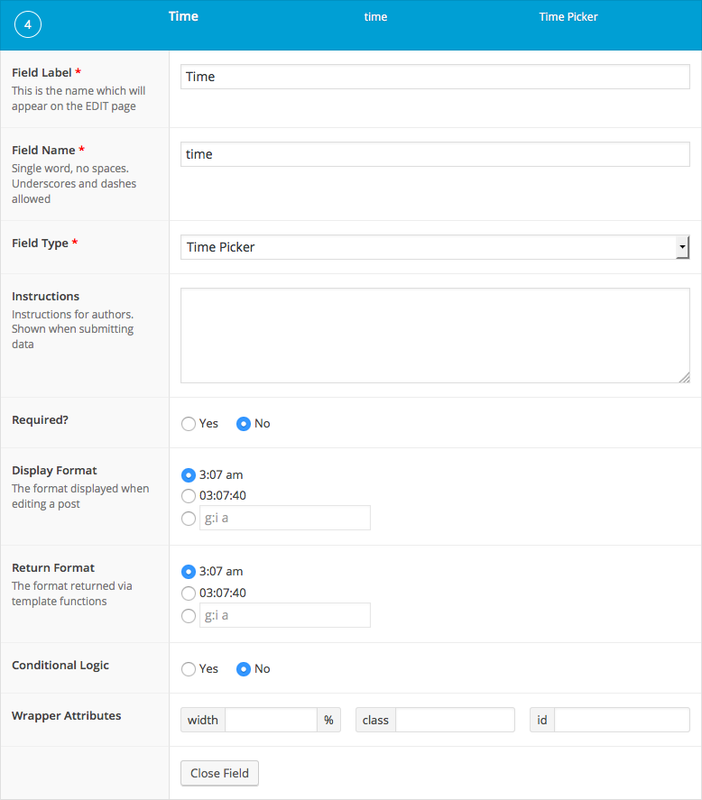 The time picker field creates a jQuery time selection popup. This field is useful for setting specific times to use in your theme. eg. A store’s open and close times. The value selected can be returned and displayed in different formats but will always be saved to the database as ‘H:i:s’. This format matches the time part of any datetime value. The time picker field will return a string value in the format provided in the field’s settings. This example shows how to display a time value. This example shows how to query posts for all stores that are open. This example assumes a post type called ‘store’ exists with a field for each day’s open and close time in the following naming convention: ‘monday_open_time’, ‘monday_close_time’, ‘tuesday_open_time’, etc. When working with the meta_query array, remember that WP reads this as $meta $compare $value (‘monday_open_time’ < $time) (‘monday_close_time’ > $time).